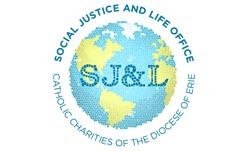 The Social Justice and Life office serves to inform, educate and invite parishes and individuals in the diocese of Erie on matters of social justice and a consistent ethic of life. Informing through the lens of Catholic Social Teaching as cultivated through the voices of our Pope, bishops, and lay leaders, we invite all persons of faith to consider becoming involved in the local, national or international community. You are most welcome to explore our content and contact us with questions or requests regarding the ministries and services of the Social Justice and Life office.